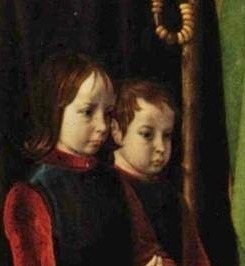 Painted in Bruges, the Portinari Altarpiece was a triptych commissioned by Tommaso Portinari, the manager of the Bruges branch of the Medici Bank. It was intended for the high altar of Sant' Egidio in the church of the Arcispedale of Santa Maria Nuova in Florence, which was created in 1288 by his ancestor, Folco Portinari. The triptych - which depicts the Nativity - portrays Tommaso Portinari's family on the wings; his two young sons Antonio and Pigello can be seen kneeling on the left and his wife Maria di Francesco Baroncelli is shown on the right panel with their daughter Margarita along with several saints. It seems that this commission was a way that Tommaso, so far from home, could remind people of his civic loyalty. On the central panel of the triptych, three shepherds kneel before the infant Jesus and such rustic characters are very realistic in the scene. 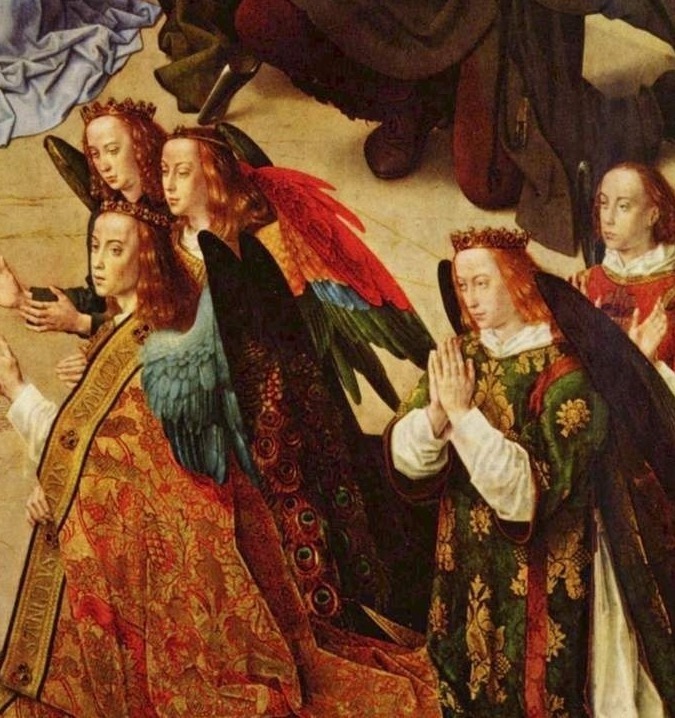 The Virgin and the Child are surrounded by angels and this rare depiction of the adoration of Jesus is likely to have been based on one of the visions of Saint Bridget of Sweden. In the background, van der Goes created scenes relating to the main theme: on the left panel, Joseph escapes to Egypt with his pregnant wife; and on the right panel, the Three Magi travel to Bethlehem. It's believed that the Portinari Triptych arrived in Florence on 28 May 1483, apparently some years after its completion by van der Goes. Legend has it that the work was shipped from Bruges by sea, with funding provided by the banker Niccolò di Giovanni Capponi, and arrived in Pisa via Sicily. It was then transported along the Arno and finished its journey at the Porta San Frediano in Florence where it was thought to have been carried to its destination by sixteen burly porters under the watchful eye of of Meo di Tingo, an ambassador of the Arcispedale. 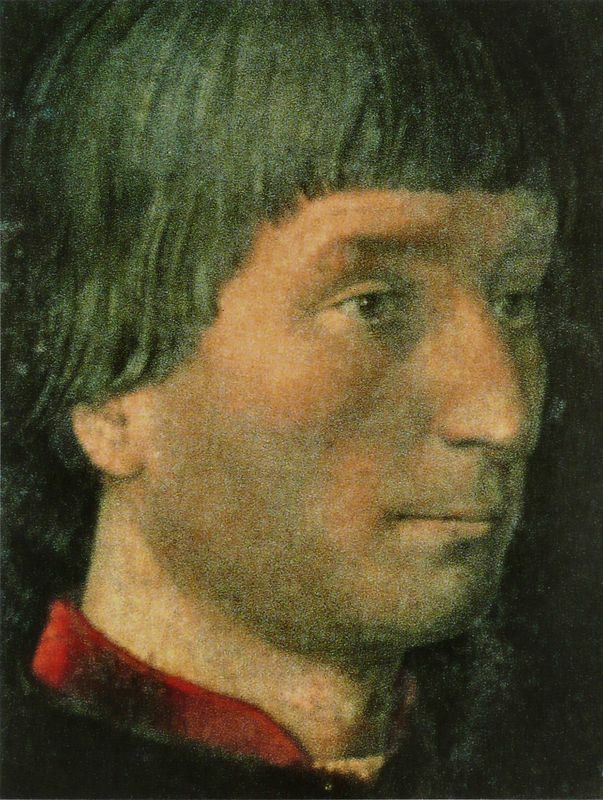 As well as employing the services of Hugo van der Goes, Tommaso Portinari had also commissioned a painting from Han Memling, also to be displayed in the Arcispedale of Santa Maria Nuova. On the left-hand panel, Tommaso Portinari is shown with his sons Antonio and Pigello and each adores Christ while St Thomas and St Anthony Abbot stand over them. 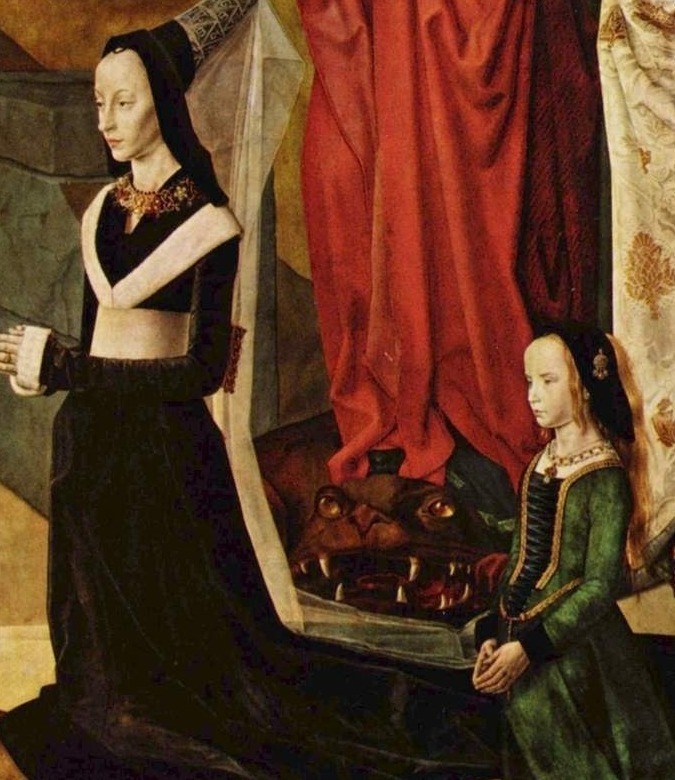 On the right-hand panel, Tommaso's wife Maria Maddalena Baroncelli Portinari and their daughter Margherita can be seen praying with St Margaret and St Mary Magdalene. There are some traditional aspects to this piece but the way in which it is brought to life is anything but. 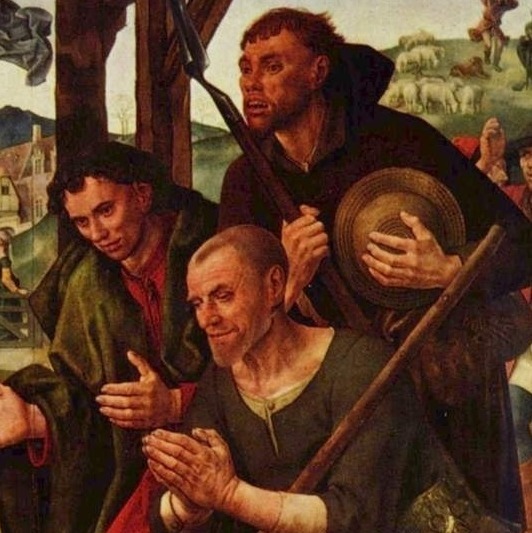 The grinning shepherds closely observing Portinari and his family praying are making gestures and serve to represent humble churchgoers. This alludes to popular religious theatre and gives the entire composition of the central scene a theatrical feel. The large central panel represents the Adoration of the Shepherds and is packed with figures, demonstrating van der Goes' talent in depicting a busy, crowded scene. 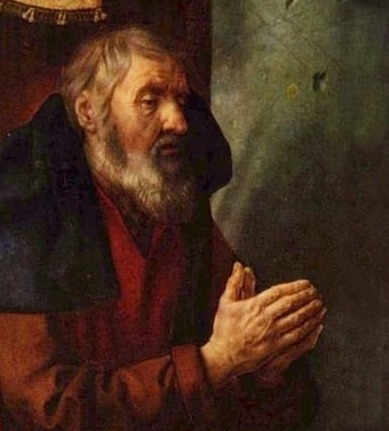 His figures are typically Northern, lacking the strong build of those found in the works of both Michelangelo and Raphael, but they still possess a realistic charm of their own. The Virgin is surrounded by the twelve apostles whose faces are racked with sorrow and regret and each figure is painted as an individual portrait, giving life to this death bed scene. When open, the Portinari Altarpiece measures over 2.5 m long and such dimensions were in accordance with a Florentine model. The central panel of this triptych depicts a nativity scene set between joy and gravity, calmness and horror. 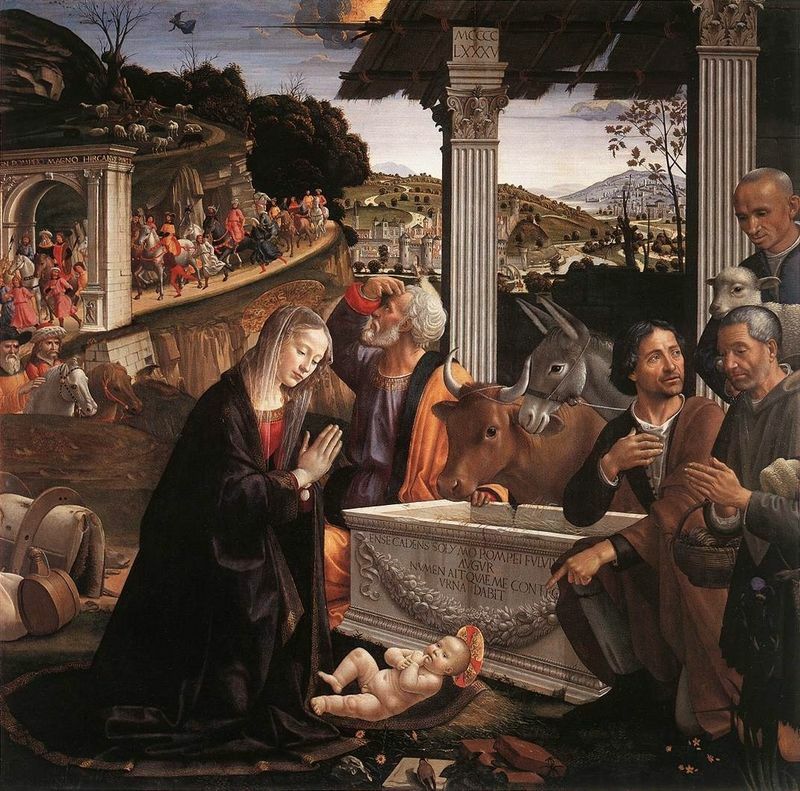 Mary and Joseph pray to the newborn child, with Joseph looking particularly somber. The shepherds appear happy and robust in contrast to the stately angels, whose faces are long as they kneel and float around. The stabled animals also express obvious devotion. However, it is the winter landscape that defines the emotional tone of the Portinari Altarpiece. The bare trees are black and set against a frosty sky over Bethlehem and the composition is laden with fear and impending death. The Portinari Altarpiece was the largest Netherlandish work on display in Florence and it was met with great praise. 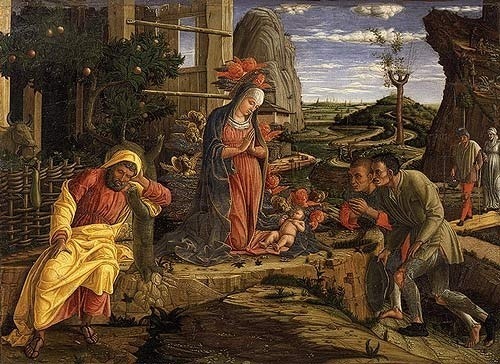 It had a huge effect on Italian painters with its masterful handling of the oil technique as well as its vibrant tones and precise attention to detail. 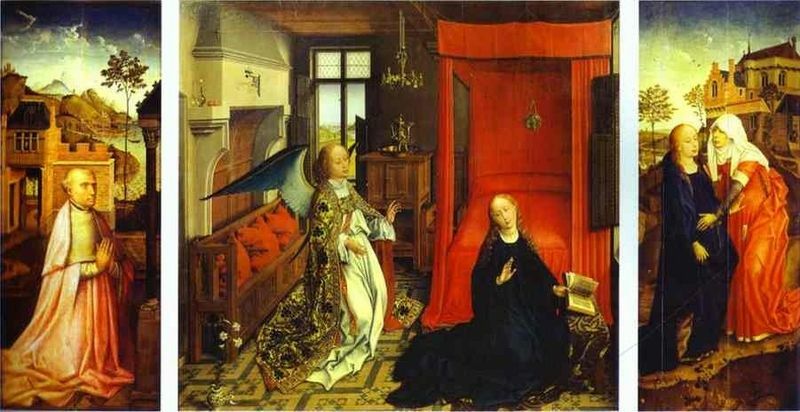 It not only influenced Italian painters who saw it but also van der Goes' Flemish contemporaries. The surface decoration varies greatly, but this is combined with clear organization of the figures and a realistic sense of spatial depth. Furthermore, the artist shows remarkable skill in merging the grandeur of perception with psychological rendering of his solitary figures, particularly the captivated shepherds. The result is an altarpiece bursting with both personality and originality. Although modern day accounts of Renaissance art put huge emphasis on patrons and religious commissioning, the book 'Gothic and Renaissance Altarpieces' states that religious art was, in fact, a platform for outstanding individualism. 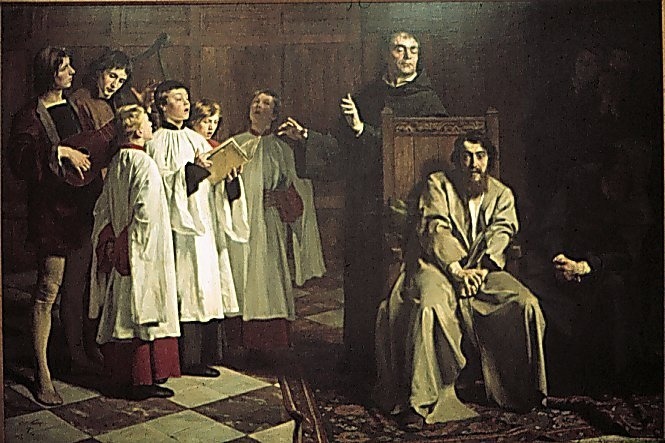 In the 19th century, Hugo van der Goes had a gothic appeal for Romantic art students and Emile Wauters's used him as his muse in his 1872 work The Madness of Hugo van der Goes. Van Gogh's work also bore similarities to that of Hugo van der Goes in terms of its intensity and it's no secret that van Gogh also had a rather fragile mind. 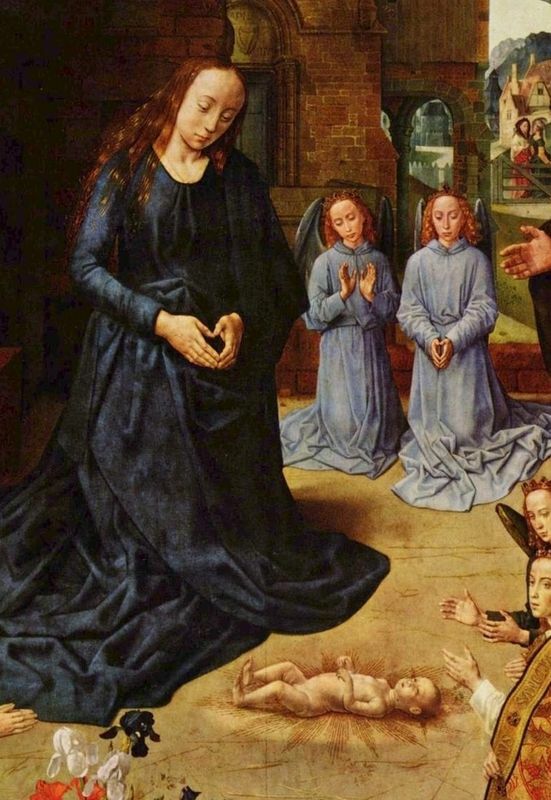 Despite this, Hugo van der Goes was treated with great respect by monks and royalty alike and is today remembered as one of the greatest artists of the 15th century thanks to the Portinari Altarpiece, deemed one of the most universal and glorious of nativity scenes. This piece also portrays the natural expressions of the Shepherds' faces first seen in the Portinari Altarpiece. After its arrival in Florence in 1483 the Portinari Altarpiece was deeply admired by Italian artists and many sought to emulate its success. This is one example, painted in the Sassetti Chapel in the church of Santa Trinita in Florence. Despite the fact that Hugo van der Goes is hailed by many as the greatest Flemish painter of the late 15th century, he only has one piece of work confidently attributed to him - the Portinari Altarpiece - which today hangs in the Uffizi Gallery in Florence. 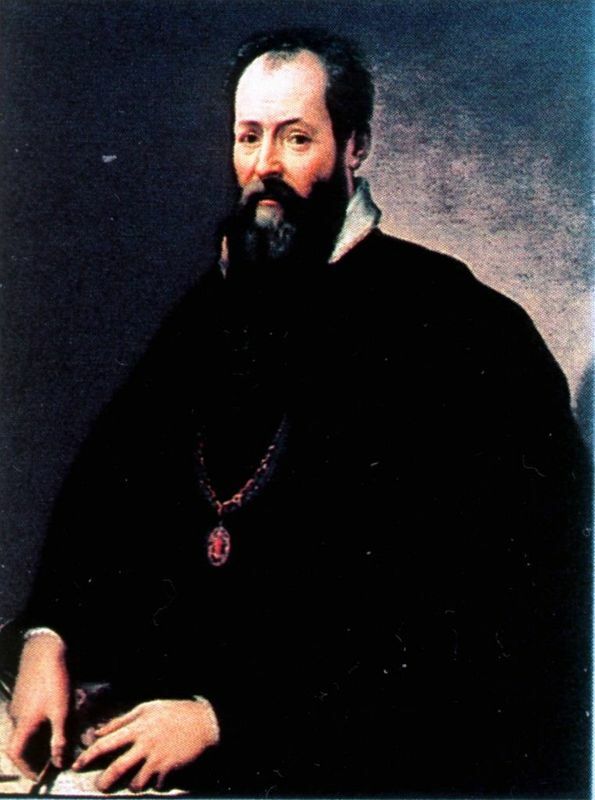 In his Vite of 1550 Giorgio Vasari referred to the Triptych as a work by "Ugo d'Anversa" ("Hugo of Antwerp"). This is the only documentation assigning the work to van der Goes and all of his other paintings are attributed to him based on stylistic comparison with the Portinari Altarpiece, which symbolized a reform of his entire oeuvre. 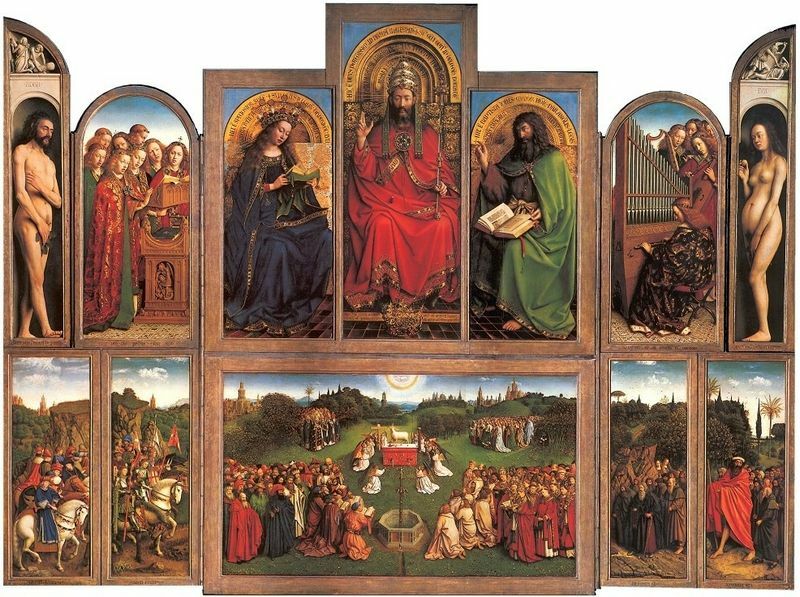 Large-scale, multi-layered altarpieces featuring various distinct scenes are among the most ambitious paintings that exist today and during Hugo van der Goes' career they offered immense scope for artistic expression and invention, and were intended to enchant the everyday churchgoer. When the Portinari Altarpiece eventually arrived in Florence, it had a profound impact on the art world, most noticeably on the art of manuscript illustration in the late fifteenth and early sixteenth centuries. 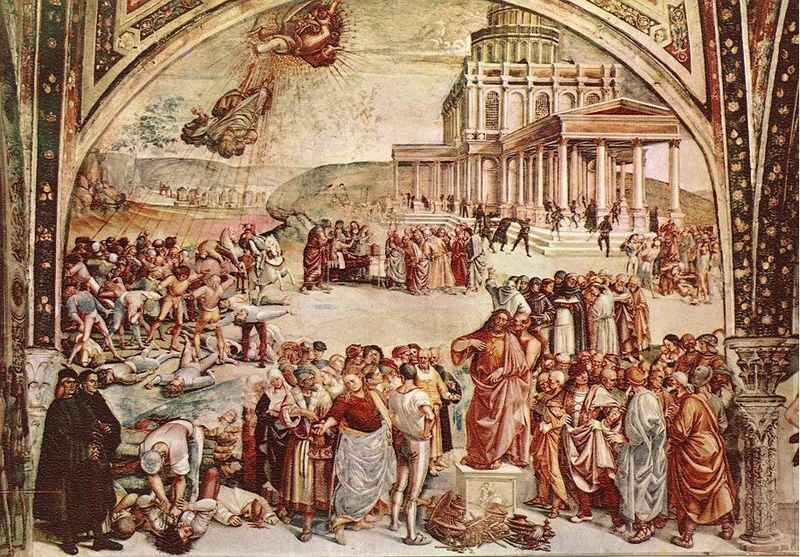 It also inspired famous representatives of Umbrian painting such as Luca Signorelli. For almost a thousand years Europe lay in the dark ages under a feudal society without any significant advancement. Sometime in the 14th Century Europe serfs were living as free men, the printing press was invented, commerce was taking off and new ideas arose. With mobility, the rise of the merchant class led to an increase in ideas, philosophy, artistic advancements and scientific innovations. Old religious ideas were beginning to change again, especially in the north which would be home to the Reformation. In Italy the Renaissance in architecture and sculpture had already taken off with the innovations made by Donatello and Brunelleschi. Insights in perspective and mathematics taken from the classics were being to show humanity in a new light. The Renaissance would take hold across both sides of Europe, although fundamentally in different manners. Later, ideas from the north and south would mix and spur along further advancement. To find out more about Hugo van der Goes, please choose from the following recommended sources.